“A Star Is Born”: What about the previous versions? 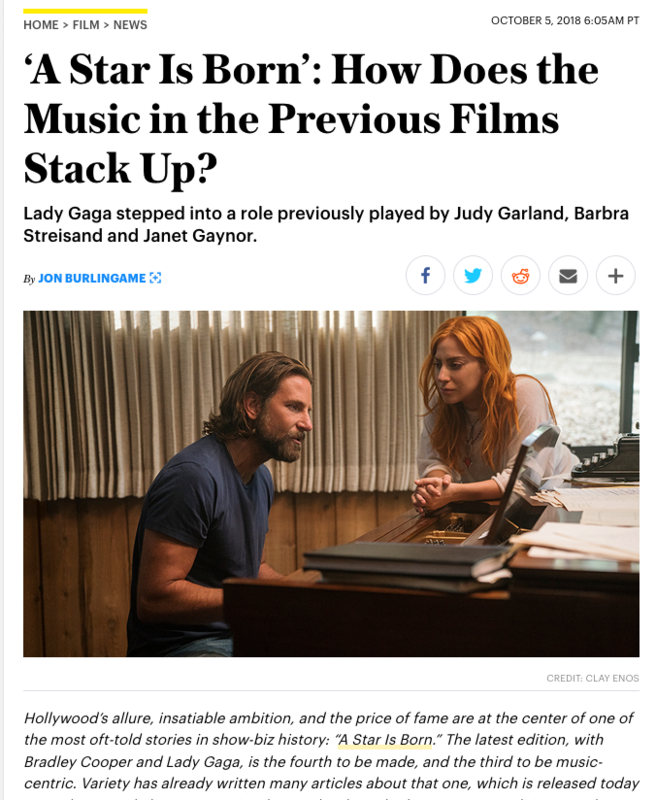 A neighbor of mine, an avid filmgoer, was surprised to learn that the current Bradley Cooper-Lady Gaga movie A Star Is Born is a remake of an earlier film (in fact, this is the third official take on the story). Variety asked me to look at the music of the prior films: the 1937 original with its Max Steiner score; the 1954 edition starring Judy Garland, with its Oscar-nominated song “The Man That Got Away”; and the 1976 version with Barbra Streisand and its Oscar-winning love theme “Evergreen.” I talked to historian Leonard Maltin, Garland expert John Fricke and songwriter Paul Williams for this fun assignment, which was even deemed one of a handful of Star Is Born-related pieces most “worth reading” by The New York Times. 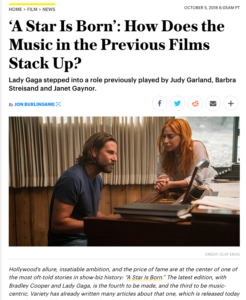 This entry was posted in Composers, Film Music, Interviews and tagged A Star Is Born, John Fricke, Leonard Maltin, music in A Star Is Born, Paul Williams, Star Is Born 1937, Star Is Born 1954, Star Is Born 1976, Star Is Born remake, Variety on October 5, 2018 by Jon Burlingame.